Thank you for your interest in Learfield IMG College Ticket Solutions. We are looking for the best and brightest individuals to join our team. At Learfield IMG College Ticket Solutions, our mission is to provide high-value expertise, world class solutions, services, and experiences to our partners and their fans, building the largest, most engaged fan bases in sports. Join a dynamic company in a growing industry filled with talented professionals and opportunities for career growth. "IMG Learfield has truly been a blessing on my career. I started working for this organization as an account executive when I was 23 years old. Many years later I am still as eager to walk into work today just like it was my first day on the job. People like Brad Sexton and AJ Arem have invested their time in me, not just as an employee, but as a person. I couldn’t ask for a better team to work with every day!" 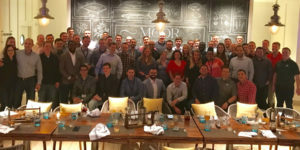 At Learfield IMG College, our culture is paramount to our success and growth as a company and the cornerstone to your success and growth as a team member. We foster a positive, competitive environment where you can learn and grow both professionally and personally. We create this culture by living it ourselves every day and putting our people first. Our commitment to our team members was recognized by Teamwork Online, LLC when we were voted best company to work for in sports. From the on-boarding and Most Valuable Practices “MVPs” to property-specific, regional, or national sales training sessions, Learfield IMG College Ticket Solutions invests to make sure our team members are set up for success. By hiring career-minded individuals with character, capacity and commitment, our team members are able to advance and grow. We have a successful history of promoting individuals into leadership positions such as General Manager and Regional Manager roles. Our culture and people are why Learfield IMG College Ticket Solutions has grown from 1 to more than 40 properties. We delivered more than $149 million in new revenues for our partners in 2018. MVP, "Most Valuable Practices", is a proprietary training and development program which is the culmination of more than four decades of benchmarking best ticket sales practices from collegiate and professional sports. The result is comprehensive sales training program customized for the college ticket and fundraising sales area and taught year round to all Learfield IMG College Ticket Solutions employees. MVP focuses on the proactive sales approach to the Learfield IMG College Ticket Solutions sales engine. The goal of the program is for sales account executives to provide superior customer service with a focus on retaining and building new fans and donors.